NOSE: Very interesting…a boatload of citrus from the hops hits you immediately. Grapefruit and lemons and maybe a little tangerine. After the hop aroma fades, your left with a yeasty, funky, sour aroma that smells more like a traditional Hefe. Backing it all up is a subtle, baked biscuit smell. TASTE: Strangely, the hops have very little presence in the taste. They only reveal themselves in a slight bitterness in the finish. The flavor is somewhere between a Hefe and a Saison. It’s a touch sour and dry, with a little farmhouse funkiness and plenty of biscuity malt throughout. MOUTHFEEL: Medium-bodied, but drinks lighter than that due to the overwhelming carbonation. It’s dry and sparkly like champagne. DRINKABILITY: Actually, not bad. It’s a fairly light, fairly refreshing brew and despite the name, it isn’t nearly as hoppy as advertised. If nothing else, it’s certainly an interesting beer. 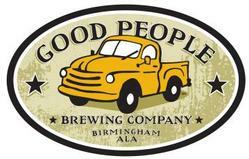 Posted in Tasting Notes.Tagged Birmingham, Good People, Hefeweizen, Hoppy-Weizen, J. Clyde.